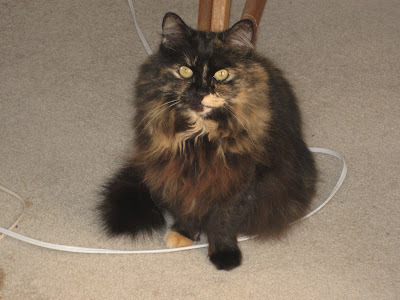 This Tortie Tuesday, I would like to write about a very special Tortie in my life; my Auntie Mattie. She lives with my Mommy's mom (my Grandma)so that makes her my auntie! I'm very proud to have Auntie Mattie in my family because she is definitely full of tortietude and a wonderful example of how special Torties are. Grandma adopted two 2 year old cats in 2003; Mattie, a tortoiseshell and Sally, a calico. Mattie was rescued by the shelter in winter 2003 and very pregnant. She was totally matted all over her body, which is where they got her name. 2 days after she was rescued, house mother Vicki came down in the morning to see that Mattie had ripped out all the matted fur on her belly to enable her babies to feed, and she had already given birth to 3 kittens. 3 more followed but 1 didn't make it. The next day, another cat that was rescued and brought to Vicki, also very pregnant, gave birth to 6 kittens, but did not survive giving birth. Mattie, without even a moments hesitation, took on the other 6 kittens as well as her own. She gave them all equal time and treated all 11 as her babies. Mattie is a hunter by choice. When Grandma got her, she regularly escaped and was very hard to catch, but usually had a bird in her mouth when she was found. Shortly after she moved in with Grandma, she had to have 9 teeth removed because of damage from malnutrition and living on her own, but still was a super mouse, shrew, chipmunk and bat destroyer in the house Grandma lived in. She once caught a deer parasite from the mice she regularly ate and nearly died, but fought back to her current perfect health. Grandma lived in a rural house near Ottawa that seemed to have an entrance for mice and rodents, so to protect Mattie from getting sick again from the mice, she had to do a better job at catching them herself. Sally was totally inept and uninterested in hunting and actually screamed when confronted by rodents. Mattie would hear her sister's screams and arrive on the scene in a split second to catch the offending rodent. Even with 4 teeth on top and none on the bottom, she made fast work of them all. Mattie caught a chipmunk once and led poor Grandma on a wild cat chase with the poor lil' chippy dangling and spraying blood everywhere up the stairs onto 2 light carpets in 2 rooms and finally back to the living room where Mattie lay under a glass table with one paw over the dead chipmunk and ,looking up through the glass, meowed very loudly and proudly, with blood all over her face. Grandma was horrified but Mattie was so proud of herself that Grandma had to congratulate her. Grandma has since moved to an apartment where she doesn't have the mouse problem that she did in that big old house, but Mattie still finds a way to hunt by catching flies and spiders. She has since had to have the rest of her teeth removed, but she still eats her dry food somehow (even though Grandma offers her wet food, of course)! Poor Mattie had a terrible start in life but now that she lives with Grandma, she is thriving and very happy. Mattie has a fascination for computers so I'm hoping that I can convince her to write some Tortie Tuesday lessons in the future. I know I could learn a lot from my auntie! Deli I'm proud of your Auntie Mattie looking after all those kittens! Good for her. You have a good role model to look up to! Your Auntie Mattie has lived several of her nine lives! Mattie the MIGHTY hunter cat, we are in awe of her beauty and skill!! Auntie Mattie has been living an interesting life! She is a great huntress! Auntie Mattie is our hero! Wow, we'd love to meet her or at least learn some lessons from a real pro who has really lived the life of a huntress! She and Sally are both very lucky to have your Grandma to rescue them! Aunt Mattie has had quite the life! We hope we can hear more stories from her! WOW! Your Aunt Mattie is something! I bet she has marvelous tales she can tell about her hunting--CHIPMUNK? Wow, your Aunt Mattie is amazing! Nothing less than Callie would expect of a tortie, of course, but even extra special amazing, with all she's been through and all she's done. And she's quite beautiful, too. We hope we'll get to hear more from/about her in the future. We'd also like to know more about your Aunt Sally, too. Thanks for sharing Auntie Mattie's story. Your Auntie Mattie is one amazing cat! Your Auntie Mattie sure is one amazing, courageous, and stunning kittie! Her story made mom give us B~I~G hugs as it's sad to hear what a terrible start she had! And, your Grandma is a wonderfurl lady for taking in Auntie Mattie and giving her a furrever home! Wow....your Auntie Mattie is wonderful! What a great story! Thanks for sharing!!! Sorry we haven't been able to visit in a while!!! Oh, what a wonderful story! We think Aunt Mattie is an awesome role model for all torties. We're so glad she now has a loving appreciative home, where she can be queen. She is a very special Tortie! Oh thank your for introducing us to your Auntie Mattie. She sounds like a wonderful kitty. And it sounds like she has had a very lucky life since she was rescued - and found a wonderful home!! Mattie is a lovely lady! She is very lucky to have your Grandma. We would like to hear more from you. an amazing cat and a tortie. I always knew torties were super special! What a wonderful story Mattie! You are certainly living life to the fullest...Enjoy every day! What a wonderful tribute to your Aunt Mattie, Delilah. Thank you for sharing her story with us....we really enjoyed it. We think you are both very special Torties. My goodness, Mattie sounds like a very special lady! That was a great story about your Auntie Mattie! We think you have a great Auntie and your mom has a pawsome Grandma. 11 kitten, oh my cat! Wow, Mattie certainly had a tough start in life, but she rose above your own needs to help others -- like those little orphaned babies! What a girl! Not only is she a beauty, but she's a capable huntress as well (obviousy), even though it may not always be entirely appreciated. I'm so happy that your auntie and your grandma found each other and that efurryone is living the good life now! Auntie Mattie is a beautiful tortie! It's wonderful that she took care of all those kittens and she certainly is a mighty hunter! Thank you for introducing us to your incredible Auntie Mattie! I have a noo superhero! Auntie Mattie you are fabulous! What a great ladycat! Nice to hear about Auntie Mattie. Your aunt Mattie sound like a wonderful representative of the torties. Auntie Mattie is such a special cat! I would love to get lessons in hunting flies and spiders from her! I never did get to eat the spider from my Monday post...it got away. Wow your Auntie Mattie is really awesome! !